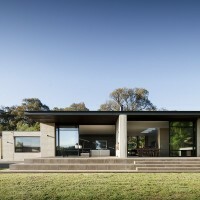 Robson Rak Architects have designed a house on a 10-acre farm located in Merricks North near Melbourne, Australia. 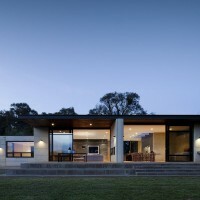 The clients; a couple with two young boys, had bought a 10-acre rural farm block with a little farmhouse in Merricks North, 50 minutes drive from Melbourne. The property was bought as a weekender with the intention of building a new house with enough room for their family to grow and enjoy through the generations. 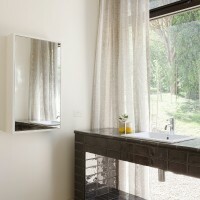 The clients had also sought a south facing site due to one of them having a particular sensitivity to direct sunlight. 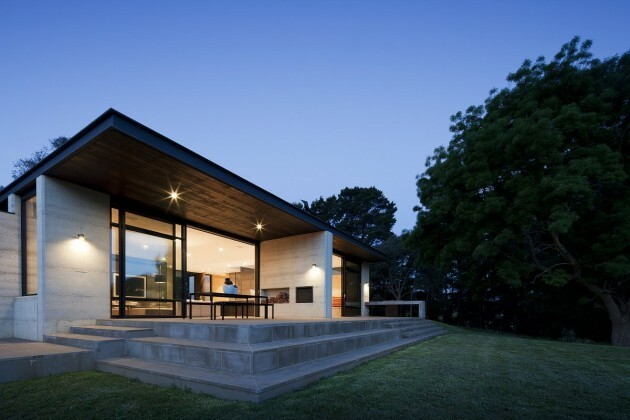 The initial brief for the house was for a simple rectangular box with symmetrical spaces. The objective being for the creation of order and symmetry to simplify ones life. In addition to this there was to be no direct harsh light into the house; just a natural glow of light throughout. We convinced the clients that by breaking up this rectangular boxed plan we could create more interesting spaces that offered the order and quiet the client desired but also created a dynamic building which also offered surprising little retreats such as the window seat next to the fireplace. By responding to the natural fall of the land we created two levels to the building with three distinct zones, the effect being a long, low presence on the landscape. 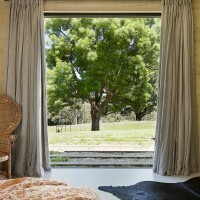 The ‘Plane’ tree outside the master bedroom to the south determined the planning and position of the house. The master bedroom was centered off this tree and the house and its zones extend to the west from here. The parents zone to the east, consists of a master bedroom, walk in robe, ensuite, and study space. 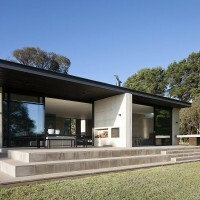 The study can be accessed directly from outside and also has it’s own private view to the north of the property. The central zone of the house is the main living, dining, kitchen area, and includes the entrance to the house. 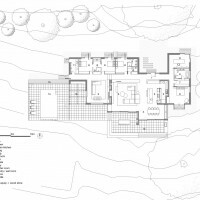 In response to the brief of ensuring plenty of natural light without any harsh direct Northern or Western sun into the main living areas, an eave was designed which shades thin long high level windows above the dining and the living areas. Strategically placed skylights and glass windows assist in the constant glow this house is being bathed in. i.e. 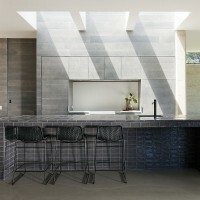 ; the skylights over the kitchen bench and front door windows ensure that the central zone is bathed in beautiful light from sunrise to sunset. 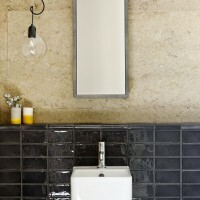 The kitchen consists of two parts – A front kitchen with a large island bench constructed of hand made tiles, and a more utilitarian rear butler’s kitchen made from stainless steel. There is also a guest bedroom, ensuite, and powder room in this zone. By stretching the study to the north we’ve created an entrance space defined by three high-rammed earth walls. The entrance; designed to be quiet, is indicated simply by 3 timber sleepers set into Lillydale topping on the ground. Upon arrival one is then greeted by a large timber paneled entry door with a large bespoke door handle sided by two full height windows allowing one to see the stunning and majestic views through the building. A wall of joinery from the main living room acts as a services spine houses all of the heating, cooling, TV / audio and wraps around into the corridor and down to the lower zone, linking the two spaces. The lower zone of the house is the children’s zone. It consists of two bedrooms with a shared ensuite, a second living space, and a laundry / mud room. This level of the house opens directly onto the pool and pergola where the kids can enjoy external activities. The pool is enclosed with a glass pool fence on three sides and to the north there is a timber enclosure that houses all of the pool equipment and wood store, but also acting as the pool fence on this side. The pool has an infinity edge to the south. 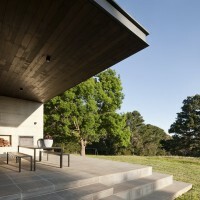 A large outdoor terrace was created without balustrading so as to not interrupt the spectacular views. An outdoor fire and wood store allow for the living space to be moved outside all through the year. The steps leading to the grassed area were broken up and doubled up to allow for lounging around. Large cushions are often placed on the steps to lie there in the sun on good days. 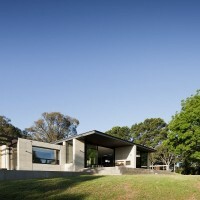 In accordance to the client’s desire for simplicity and material honesty, the house has been reduced to a modest palette of earth, glass and timber. 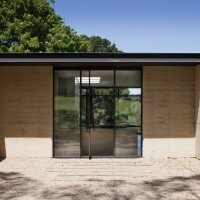 Using one of the oldest and most natural building methods, local sand sourced from the peninsula was used for the construction of the rammed earth walls. 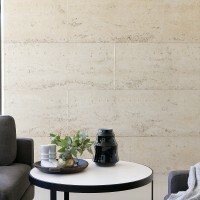 The majority of the internal walls are rammed earth creating a beautiful, warm, textural look and feel; taking on a life and personality of their own as they change throughout the day depending on the light. The walls are 400mm thick with an internal strip of 100mm thick foam insulation, assisting the natural qualities of the rammed earth in maintaining a consistent internal temperature. This brings the R-value of the walls up to a very high level, and the double-glazing of all windows and doors assists the building in being extremely environmentally efficient as attested by our clients. 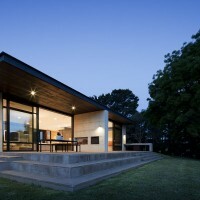 The high thermal mass of these walls has made the house thermally efficient. Openable windows on the east, west, north and south allows cross ventilation. 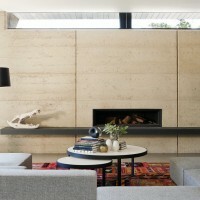 The rammed earth is excellent for high fire risk areas, having a 4-hour fire rating. 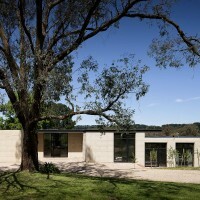 Rammed earth has very low ‘embodied energy’ in its production and construction.